Arcadis like Accell Group has bought companies which have not increased value per share. The balance sheet is getting worse and worse. SECTOR: [PASS] Arcadis is neither a technology nor financial Company, and therefore this methodology is applicable. SALES: [PASS] The investor must select companies of "adequate size". This includes companies with annual sales greater than €260 million. Arcadis's sales of €3 219 million, based on 2017 sales, pass this test. CURRENT RATIO: [FAIL] The current ratio must be greater than or equal to 2. Companies that meet this criterion are typically financially secure and defensive. Arcadis's current ratio €1 449m/€1 107m of 1.3 fails the test. LONG-TERM DEBT IN RELATION TO NET CURRENT ASSETS: [FAIL] For industrial companies, long-term debt must not exceed net current assets (current assets minus current liabilities). Companies that meet this criterion display one of the attributes of a financially secure organization. The long-term debt for Arcadis is €620 million, while the net current assets are €342 million. Arcadis fails this test. LONG-TERM EPS GROWTH: [FAIL] Companies must increase their EPS by at least 30% over a ten-year period and EPS must not have been negative for any year within the last 5 years. Companies with this type of growth tend to be financially secure and have proven themselves over time. Arcadis's lack of EPS growth over that period fails the EPS growth test. Earnings Yield: [FAIL] The Earnings/Price (inverse P/E) %, based on the lesser of the current Earnings Yield or the Yield using average earnings over the last 3 fiscal years, must be "acceptable", which this methodology states is greater than 6,5%. Stocks with higher earnings yields are more defensive by nature. Acardis's E/P of 6% (using the current Earnings) fails this test. Dividend: Arcadis paid a dividend of €0,47, which resulted in a 3% dividend yield. I don't know if they are paying dividends in 2018. 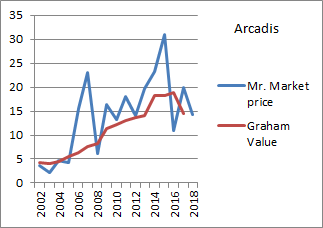 Conclusion: The stock price determined by Mr. Market swings up and down much more than the intrinsic value of Arcadis. As Benjamin Graham, the father of value investing explained: "true investors can exploit the recurrent excessive optimism and excessive apprehension of the speculative public." See www.beterinbeleggen.nl for in-depth analysis of quality companies.